The Dekati® Cyclone is an all stainless steel cyclone for removal of large particles from a sample stream. Manufactured according to EPA standard 201A (EPA standard 201a.pdf), with standard isokinetic nozzles available as accessories, the Dekati® Cyclone is a highly durable addition to any sampling line where removal of large particles is needed. The cyclone can either be placed directly into the flue gas inside the stack or used in an out-stack configuration with a heating jacket around it. 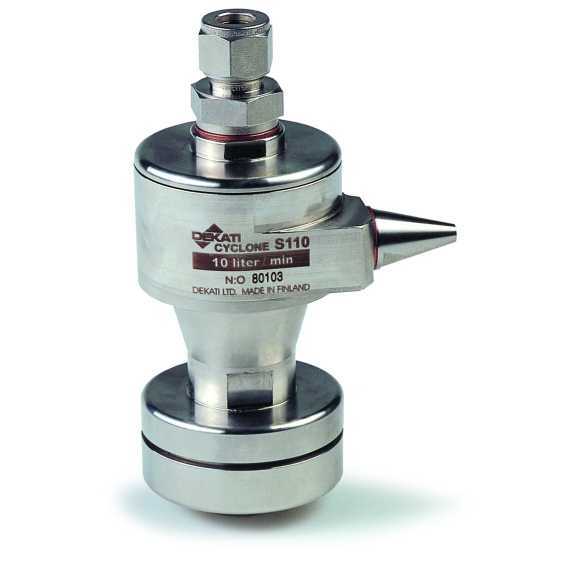 All accessories for a complete setup are available from Dekati Ltd.
Pre-separator cyclone with 10 µm cut point at 10 lpm. Provided with a calculation sheet used to easily calculate the cyclone cut-point in different operating conditions according to the EPA standard 201A.